Shelly's Adventures offers unique and fun-filled educational resources that incorporate American Sign Language (ASL) while telling a story. 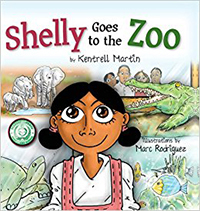 In Shelly Goes to the Zoo, Shelly and her friends spend a day with animals. While exploring the different exhibits, she teaches them animal signs and shares a few interesting facts, too. By the end of the book let's see how many signs you have learned!